The 13 seed Bucknell Bison travel to KeyBank Center to play the 4 seed West Virginia Mountaineers on Thursday, March 16, 2017 in the NCAA Tournament. The opening line for this game has West Virginia as 16.5 point favorites. The Bison come into this game with an overall record of 23-8. They are 7-1 against the spread and their over/under record is 3-2. The Mountaineers have an overall record of 24-7. They have an over/under record of 15-11 and they are 13-16 against the spread. For expert handicapping advice on this matchup and other NCAA basketball games check out our handicapping tips. Zach Thomas comes into this contest averaging 16 points per game while playing 29.5 minutes per night so far this season for the Bison. He pulls down 6.6 rebounds per game and dishes out 3.5 assists per game as well. His field goal percentage is 48% while his free throw percentage is currently at 82%. Nana Foulland averages 14.9 points per game in 27.5 minutes per contest this season. He averages 1.2 assists per contest and 7.8 rebounds per game for Bucknell. His field goal percentage is 63% for the year while his free throw percentage is 56%. 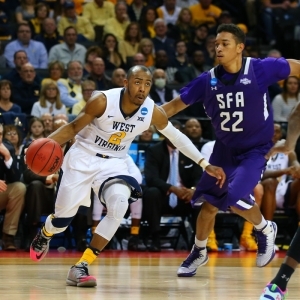 Jevon Carter averages 13.1 points per game while playing 31.7 minutes per contest this year for the Mountaineers. He grabs 4.9 rebounds per game and has 3.9 assists per contest on the year. His field goal percentage is 45% and his free throw percentage currently is at 77%. Esa Ahmad averages 11.2 points per game this season and he sees the court an average of 23.7 minutes per contest. He also averages 4.2 rebounds per contest and 1.7 assists per game. His field goal percentage is 48% and his free throw percentage is 65%. Bucknell averages 76.1 points per contest this season which ranks them 109th in the nation. Their average scoring margin is 8.8 and their shooting percentage is 48% as a team which has them ranked 25th. Behind the arc they shoot 38% which is good for 59th in the country. They average 34.4 rebounds per game and 14.6 assists per game which ranks them 252nd and 99th in those offensive categories. In the turnover department they rank 155th with 13.3 per game. The Bison allow 67.4 points per game to their opponents which ranks them 61st in the nation. They also allow a 43% shooting percentage and a 34% average from behind the arc ranking them 107th and 126th in those defensive categories. Opponents average 33.4 rebounds a game which ranks 85th and they give up 12.0 assists per contest which puts them in 88th place in the country. They force 13.9 turnovers per game which ranks them 248th in Division 1. West Virginia averages 82.0 points per game this year which ranks them 21st in Division 1 college basketball. Their average scoring margin is 15.6 and their shooting percentage is 46% as a team which has them sitting in the 99th spot in the country. Behind the arc they shoot 36% which is good for 130th in the nation. They average 37.4 rebounds per game and 16.7 assists per contest which ranks them 93rd and 16th respectively. In the turnover department the Mountaineers rank 253rd with 12.3 per game. The Mountaineers allow 66.3 points per game to their opponents which ranks them 45th in the country. They also allow a 42% shooting percentage and a 35% average from behind the arc ranking them 105th and 188th in those defensive statistics. Opponents average 34.7 rebounds a game which ranks 148th and they give up 12.1 assists per contest which puts them in 91st place in the nation. The Mountaineers force 20.4 turnovers per game which ranks them 351st in college basketball. The Bison are 96th in the nation in offensive rating at 108.1. They assist on 54.3% of their shots, which ranks 137th in the country. In terms of pace they average 70.5 possessions per 40 minutes, which places them 129th among D-1 teams. They are 28th in effective field goal percentage with 55%. As a team they are 40th in the country in true shooting percentage with 58% and they shoot 3 pointers on 39% of their shots. Bucknell turns the ball over an average of 16.9 times per 100 possessions and they get a steal on 10.2% of their opponents possessions. Their total rebound percentage of 50.8% places them 148th in Division 1 while their offensive rebound percentage is 26.8%. The Mountaineers are 30th in the nation in offensive rating at 112.7. They assist on 57.7% of their shots, which ranks 58th in the country. In terms of pace they average 71.4 possessions per 40 minutes, which places them 93rd among D-1 teams. They are 124th in effective field goal percentage with 52%. As a team they are 143rd in the country in true shooting percentage with 55% and they shoot 3 pointers on 33% of their shots. West Virginia turns the ball over an average of 14.2 times per 100 possessions and they get a steal on 14.3% of their opponents possessions. Their total rebound percentage of 51.8% places them 104th in Division 1 while their offensive rebound percentage is 37.7%.